About taxes and revenues and growth. He just can’t stop lying. You can look to the following two graphs to assess the veracity of his account of the JFK and Reagan episodes. 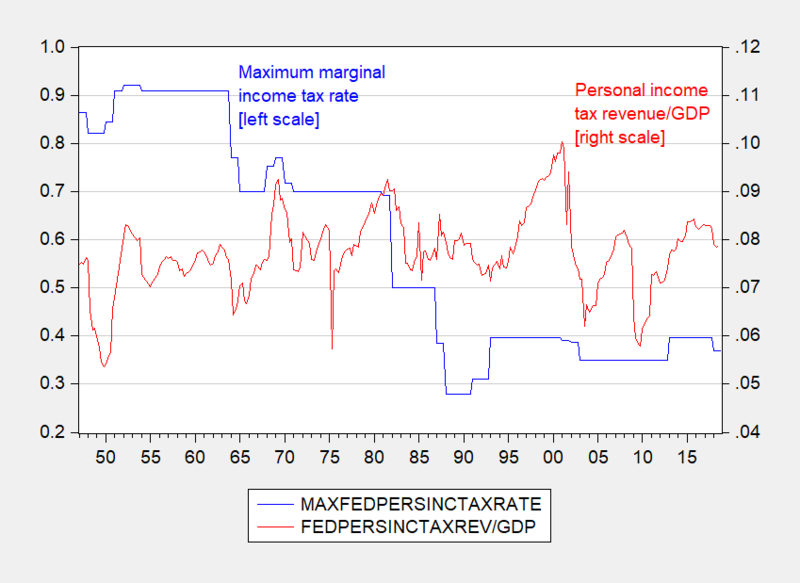 Figure 1: Maximum marginal tax rate (blue, left scale), and personal income tax revenue as a share of GDP (red, right scale). Source: Tax Policy Center, BEA, author’s calculations. 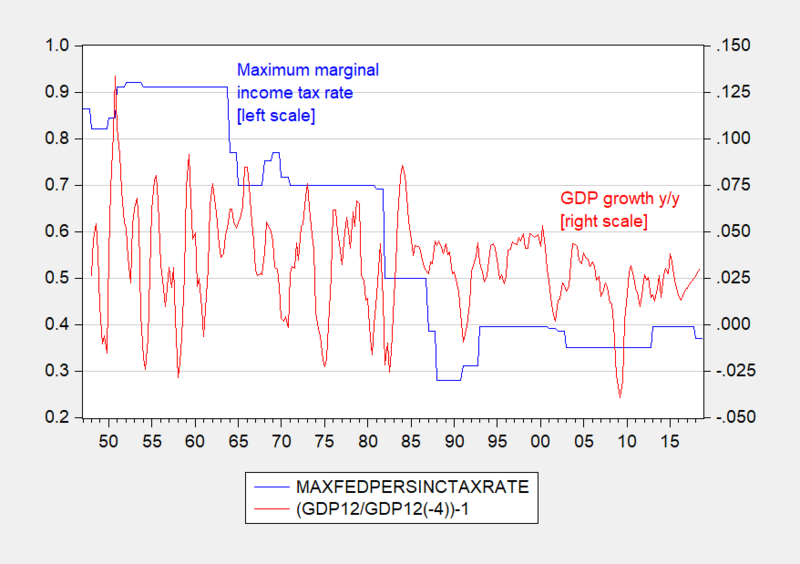 Figure 2: Maximum marginal tax rate (blue, left scale), and year on year growth rate of of real GDP (red, right scale). Source: Tax Policy Center, BEA, author’s calculations. As for the first episode, see Goolsbee (BPEA, 1999). What inspired Governor Walker’s latest bout of dissemblement? Apparently, he was trying to obscure the actual effects of the Tax Cuts and Jobs Act. Below I plot the Federal structural budget balance (and actual) as a share of potential GDP, but plotting revenues alone would not yield a different picture. 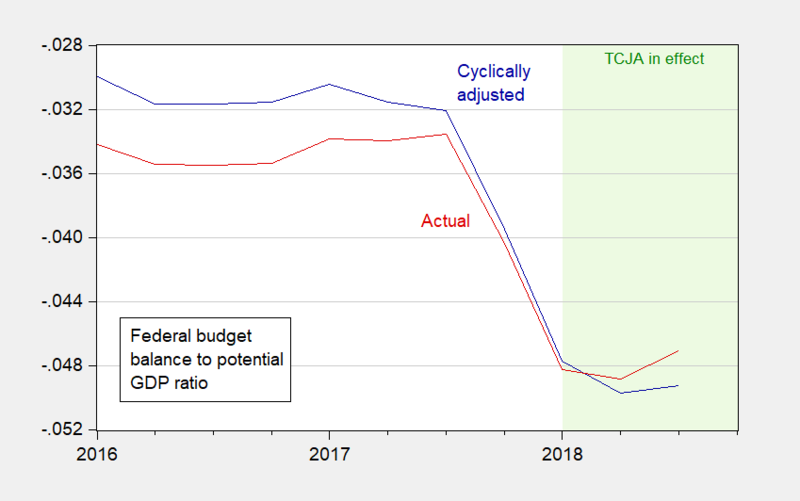 Figure 3: Actual (red) and cyclically adjusted Federal budget balance as a share of potential GDP. Source: CBO, Budget and Economic Outlook, January 2019, and author’s calculations. Let that be Mr. Walker’s epitaph. This entry was posted on February 11, 2019 by Menzie Chinn. The stupid foolishness that men do lives long after they are gone. The start of WW1, the Balfour Declaration, the destruction of the Ottoman Empire, Vietnam, Iraq and so on. One should realize that mr. walkers top fund raisers probably have done quite well under his policies. PolitiFact notes the 1960’s and 1980’s but does not address Walker’s spin about the 1920’s. Alas BEA data does not start until 1929. I have seen some discussions that claimed real revenue per capita actually fell during the 1920’s but I would appreciate it if there is some reliable evidence for this period. It’s an old paper by Christina Romer in which she re-evaluates the official Commerce Department estimates of pre-Kuznets GNP. What she found was that the official Commerce Department story greatly overstated the depth of the 1921 recession. There are some income tables in the appendices. Also note that the final version of this paper appeared as “World War I and the Postwar Depression: A Reinterpretation Based on Alternative Estimates of GNP,” Journal of Monetary Economics, Vol. 22 , No. 1, July 1988, pp. 91-115. I’ve only read the NBER working paper version. Thanks. An impressive piece of research. Jumping to table 8 the revised measure of real GNP shows that the average annual growth rate from 1918 to 1928 was only 3%. If Walker and his ilk want to peddle this as some supply side miracle – my Brooklyn neighbors have a bridge for sale! pgl: The link to Goolsbee (BPEA, 1999) in the post addresses the first episode. I always love it when a supply-sider claims Federal revenues doubled from 1980 to 1990. Of course this is in nominal terms and is talking about total revenues. Real payroll taxes certainly soared because of that 1983 tax increase. Real income taxes barely grew over the decade. One would think with an economy growing at 3.5% per year in real terms one should have had a larger increase. Oh wait – real growth during the Reagan-Bush41 years was only 3%. This is something that might be of interest to Trump voters, particularly in Oklahoma farm-country (many of whom PeakIgnorance and Dogberry Hall will be happy to know, have not wavered in their fanaticism). I can’t get past the paywall as of now, if anyone knows how to break past this paywall please tell me. I suspect in the next 72 hours or so, other sites will pick this story up and make the more choice or pearls parts of the article available for free on their site. If and when they do I will put it in this thread and/or whatever Menzie’s most recent thread is. Of course this abuse of reporters at Trump rallies is old news. Interesting to read the comments section of this link, along with the numbers. Again shows you how people of low education will vote against their own personal interests. “According to the 7th Circuit Court of Appeals in the Midwest Illinois, Indiana and Wisconsin saw twice as many farmers declared bankruptcy in 2018 compared to those that did during 2008. In the 8th Circuit from North Dakota to Arkansas, bankruptcies were up 96 percent. In the 10th Circuit including Kansas Colorado and Oklahoma, they rose 59 percent. Last year, farm debt rose to $409 billion, with the average size of loans in the 4th quarter at $74,190, THE HIGHEST 4th QUARTER LEVEL IN HISTORY. It must be a Wisconsin thing. Paul Ryan does the same thing and deserves a similar epitaph, but with the note that he was quite happy to sacrifice the well-being of American citizens in the pursuit of ideology, and then quite happy to abandon that ideology when his tribe took power. Paul Ryan lies more often than Trump lies. But he smiles when doing so which leads some in the press to think he is some sort of policy wonk. We need better reporters. Watching Trump tell one lie after another about the WALL. All of a sudden Lawrence Kudlow has to cut off boss man’s rant with his own statement. Something about gloating about how poorly the Chinese stock market is doing. Hey Larry – go back to taking your cocaine. Geesh! Brooklyn jury convicted El Chapo on all 10 counts! Rumor has it that the courts seized this assets estimated worth $14 billion! Shhh – don’t let Trump know is that there is some big piggy bank lest he uses it to build his wall with Mexican money. He was just today that we need to paint it and make it beautiful. Of course El Chapos successors know where all those tunnels are so no wall is going to stop them. I found this in one of those blogs Menzie introduced us to. They even “bless” us with the great economists Kevin Hassett and Glen Hubbard. MAGA Heaven. My cup runneth over…….